The Foundation for the Preservation of the Santa Susana Mountains (the Foundation) was formed in May 1974 as a charitable organization qualified under IRS §501(c)(3) to support the acquisition of land identified as ideal property for a state park in the Santa Susana Mountains and Simi Hills. The Foundation was successful in acquiring land, and ultimately facilitated the purchase of 670 acres for what is now the Santa Susana Pass State Historic Park. The Foundation was recently honored as "2019 Non-Profit of the Year" by the Chatsworth/Porter Ranch Chamber of Commerce. Pictured from left to right are Wendi Gladstone, Bob Dager, Vicki Briskman (Chamber outgoing Board Chair), Glenn Bailey, Jelena Csanyi, and Ron Schulkin (incoming Chamber Board Chair). Four new picnic tables were recently installed at the Andora Trailhead of the SSPSHP. They were purchased by the Foundation using grant funding and were transported from Northern California and assembled by the California Department of Recreation and Parks staff. The Foundation's stagecoach was a popular attraction at the Pioneer Day event held at the Homestead Acre on October 7, 2018. 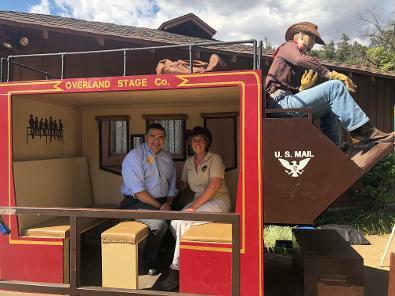 One of the State legislators who represents the park area, Assemblyman Dante Acosta, joined Foundation Board member Wendi Gladstone inside the stagecoach. The Foundation and State Park volunteers enjoyed participating in the 2017 Chatsworth Holiday Parade. 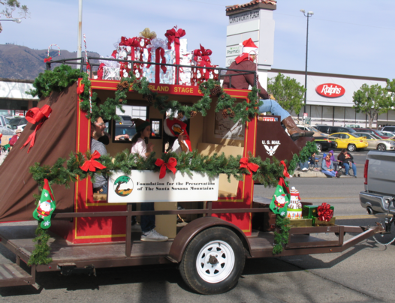 This year the stagecoach was decorated with the theme of "Unwrap the Magic of the Santa Susana Pass State Historic Park." Ralphs and Food for Less will contribute 1% of your eligible purchases to the Foundation to benefit the SSPSHP. Register your Ralphs Rewards card online and then sign up for Community Rewards by linking your card to the "Foundation for the Preservation of the Santa Susana Mountains" (organization number 93414). Click here for instructions. Once you are successfully enrolled, each of your receipts should have this wording at the bottom: "At your request, Ralphs is donating Foundation for the Preservation of th"
Thank you for your support of the Foundation and of the Santa Susana Pass State Historic Park! The schedule of upcoming Spring hikes are posted on our Hikes and Events webpage. Thanks to everyone who attended the 80th Anniversary of the Stagecoach Trail Plaque Dedication on March 17, 2019. The group photos will be uploaded to this website soon -- please check back. New for 2016: California State Parks has produced a revised brochure for the Santa Susana Pass State Historic Park, which is linked here. The printing of the new brochure was funded by a generous grant by the California State Parks Foundation. For a complete list of upcoming activities, please visit our Hikes and Events page. The Foundation organized the park's first-ever Santa Susana Trails Day on May 19, 2012 with over 100 attendees, many first time visitors. Assemblymember Bob Blumenfield presented the Foundation with a State Assembly Certificate of Recognition for its "extraordinary commitment and dedication to the Santa Susana Pass State Historic Park." The next monthly Foundation meeting will include an opportunity for Park volunteers to ask questions and make comments to the FPSSM Board of Directors at 6:30 p.m.